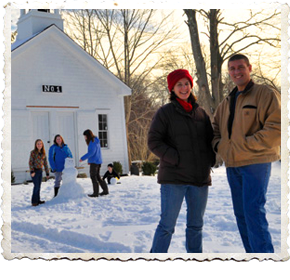 Sakonnet Farm was founded by Adam & Kristin Silveira in the fall of 2009. Looking for a family friendly business for our 4 children to participate in we decided to increase our chicken flock and open a retail business. We are a very small farm, but we try to be diversified in our efforts. We have free range egg layer chickens and ducks, Freedom Ranger chickens for meat, a high tunnel for produce production and a farm kitchen for jams, jellies, pickles, etc. In 2011 our business took an unanticipated turn and we landed in the vacation rental market with our Old Tiverton Four Corners Schoolhouse No. 1, a two bedroom guest rental house on the farm. We were so pleased with the new venture, we very quickly added another property, Potters Corner, in neighboring Little Compton. Alyssa age 17, Megan age 15, Jami age 13 and Jonathan age 11 all have their own responsibilities in our small business. This is imperative as we still carry full time jobs, Adam is an Electrical Engineer and Kristin is a nurse. We look forward to the future and what other unanticipated adventures might someday appear. The farm is located on what once was the Cavaca family compound. Manny Cavaca and his wife Marjorie raised their six daughters here in the main house. He had chickens and a garden where he grew enough produce to feed his family and share with his friends. He was the fire chief for the town of Tiverton, and the garage was the fire station for some time. Our South cottage, called the “fire barn” by the family, was brought to the property to house the firemen who stayed here in shifts.